The healthcare sector is undergoing a period of profound transformation. The industry is moving away from a volume-based approach, towards the more value-based approach to precision medicine, informed by genomics. In the next ten years, the genomic testing market is forecast to reach $10bn, with members of the public using these non-invasive, direct-to-consumer tests to learn about their genetic makeup, including understanding their ancestry and predisposition to certain illness. Since the Human Genome project ended in 2003, the healthcare sector has been predicting the rise of precision medicine – where patients are mapped to therapies based on genetic drivers of the disease.Advances in technology have since allowed us to obtain genomic data easily and affordably. The cost of sequencing the entire human genome has dropped from $100M in 2001 to less than $1000 in 2014. Now, organisations such as 23andMe are offering genetic testing and analysis to the public for less than £150, while BGI offers scientific grade Whole Genome Sequencing for as little as $600 to scientists in academia and drug development. Underpinning this growth in genotypic data is an enormous amount of phenotypic and clinical data. By correlating these data sets, we can start to build a picture of the human body and develop a much deeper of understanding of the drivers of disease.While this data revolution improves our treatment of disease and gives healthcare professionals greater means to identify the most appropriate treatments, the change is proving to be hugely disruptive. There are more than 5,000 rare genetic diseases, which each show immense clinical variation. Mining the vast amount of genetic data to accurately understand the cause of disease is highly challenging. 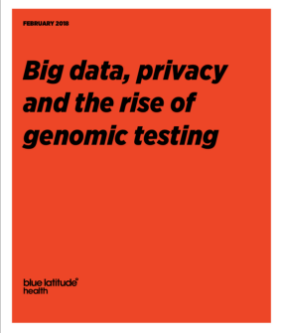 Currently, there is no standardised and federated system of genomic data entry and storage, making it nearly impossible for a single provider, medical centre, state or country to aggregate the data, conduct analysis across data sets and tap into the full potential this data presents to improve the standard of care. Blue Latitude Health spoke to Johan Christiaanse, Director of Marketing at global genomics organisation BGI, to better understand his perspective on the data challenges and opportunities within the field of genomics. Experts predict up to 50 million genomes will be sequenced by 2022. However, while our ability to sequence genomes has improved, the path from genotype to phenotype is still laden with uncertainty. The interpretation of these large data sets into useful information for healthcare professionals is one of the major barriers to precision medicine. As a result, academics are unanimously calling for standardisation to ensure interoperability between datasets and turn the data into a scalable resource, which can be analysed to reach meaningful insight. This will help inform and progress healthcare from drug discovery, to diagnosis and treatment choice. For Johan collecting and storing data from individuals who have undergone genomic testing in a public, global database would be a major driver in improving patient care and progressing scientific understanding. “Genomic sequencers generate enormous amounts of data so we are still scratching the surface. The main hurdle is understanding what it all means in the context of disease,” he explains. "As an industry, our greatest challenge is finding out how the data can be implemented." To counter this problem, BGI is working with the Chinese government on the China National GeneBank (CNBG). The pioneering hub stores 30 million traceable biospecimens. Its aim is to collect, preserve and exploit genomics resources in the hope of fostering global communication and facilitating development in precision medicine. “The Chinese government is interested in playing a big role in the development of science and technology. The whole personalised medicine trend is very powerful but sharing genomic information is just the start,” says Johan. “As an industry, our greatest challenge is finding out how the data can be implemented. It’s not just genomic data, it’s phenotypic data and it’s clinical data. Then you have to be able to correlate the clinical symptoms, the clinical development and the pathological development of the disease, and understand how it relates to the genetic data. “Everyone has unique ways of collecting data, it’s about how you store it, what you do with it and which plan will eventually fit the mould. From an investor point of view, a lot of people are participating in the field, without a larger strategy, because they feel they need to have a stake in the game,” he explains.